Did you see all the great layouts made with my new release in the post below? I just love them - and yeah, I'm rather partial to my CT gals work, LOL.....but honestly - - they are wonderful! 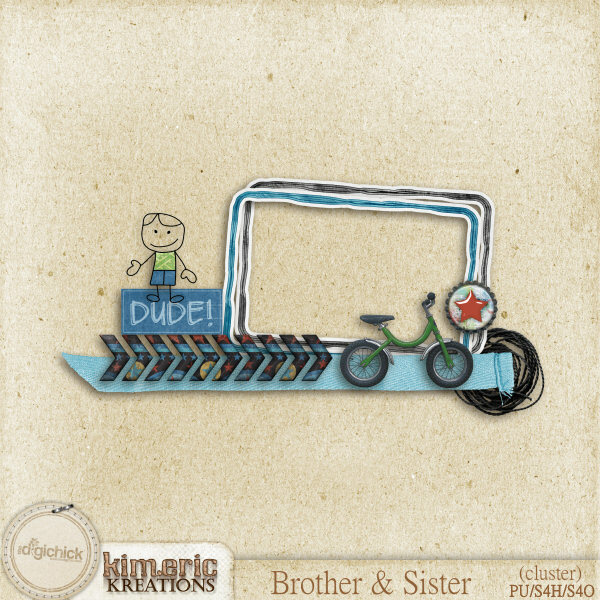 The Brother and Sister bundle is on sale (and so are the separates) thru Sunday at midnight in my shop at the Digichick. Yep - - Anita made some clusters to share with you using it, too! What a cool cluster. Thanks! Loving your new kit. so cute.Thank you. Great colors in the new kit! Thanks for the cluster. Wonderful thankyou so much....love it! Thank you so much for these adorable clusters! I also really appreciate that you leave the links up and don't have them expire. I am going through old posts today to collect all the beautiful items. Thanks again!! This is AWESOME, perfect for my grandson's pics of him on his green Haro!! !